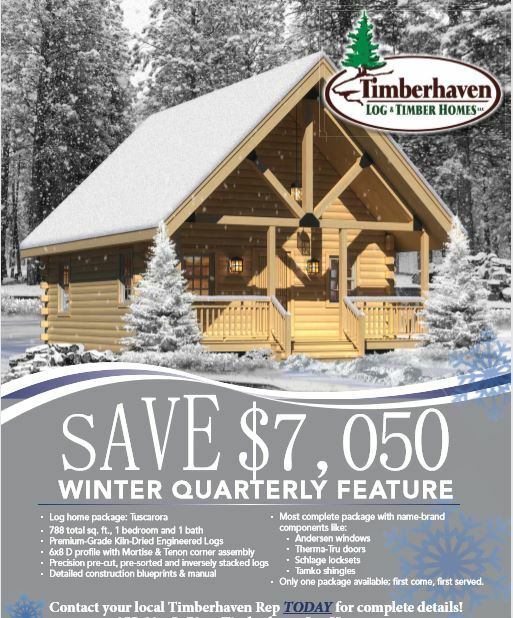 Home→Savings Offers→GET OUT OF THE COLD & INTO A COZY LOG HOME! ← Who is Morningdale Log Homes? What do we do? With this season’s blustery cold and snowy weather, who would not want to be able to come in from the cold and settle down into their favorite chair in front of a cozy fire in this cozy log home? For a limited time only, we are making this home available to the very first buyer at an sizzling, ice-melting price of $49,495* delivered to your Zone 1 building site! THAT IS A SAVINGS OF $7,050 from its regular price, and we are certain you can use that savings for many other things. If you are interested in discussing this home or any of our other log or timber homes, feel free to contact us at 814-967-2206 or email us at Sales@MorningdalelogHomes.com. We will help make your log home dream become your dream log home! *Sorry, but this offer cannot be combined with any other offers or discounts or applied to previous orders.